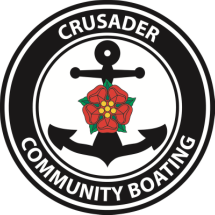 From the 2016 season onwards (and for the first time in the 20 year history of our boating service), Crusader Community Boating is operating as a registered charity in its own right and the crew volunteers are wholly responsible for raising the funds necessary to continue to provide this much-valued service to the local community of disabled, disadvantaged and elderly people. So as not to exclude anyone on the grounds of affordability, it is a core principle of Crusader Community Boating that we will continue to not charge a fixed price for these trips, relying solely on voluntary donations. The crew are therefore always very grateful for any offers of financial support from individuals and corporate sponsors. We'd love to have a chat with anyone who thinks they may be able to help us with fundraising or corporate sponsorship. Please email our Chair of Trustees or speak to any of the crew.